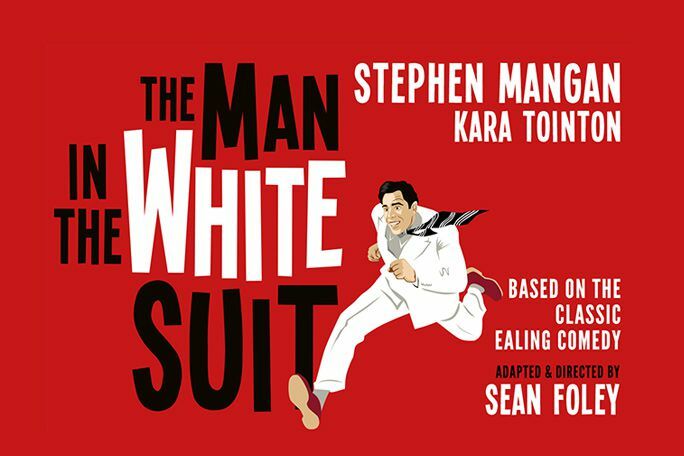 Exploding into the West End later this year, the world premiere of The Man in the White Suit will bring mystery and intrigue to the Wyndham’s Theatre from 26th September 2019. When a research chemist starts to wear a dazzling white suit with radioactive qualities, will his luminous outfit stand out from the crowd, or will his clothes and ideas begin to fray at the seams? Based on the 1951 film of the same name, follow the iconic bubbling sounds and step into the mind of Sidney Stratton at The Man in the White Suit. Stephen Mangan will play Sidney Stratton, a role made famous in the film by Alec Guinness. Most recently, he appeared in a 2018 revival of The Birthday Party at the Harold Pinter Theatre starring Zoe Wanamaker and Pearl Mackie. In 2014, Mangan starred in the Olivier Award-winning comedy Jeeves and Wooster in Perfect Nonsense as Bertie Wooster, opposite Matthew Macfadyen as Jeeves. He has also been nominated for a Tony Award for The Norman Conquests, which opened in London and later transferred to Broadway. Kara Tointon will play Daphne Birnley in the production. Tointon recently played Olivia in the Royal Shakespeare Company’s production of Twelfth Night, Eliza in Pygmalion at the Garrick Theatre, and Evelyn in Absent Friends at the Harold Pinter Theatre. Former university student turned young research chemist Sidney Stratton works as a labourer in the north of England. Developing a strong fibre, he makes a white suit out of the newly-found material. Repelling all dirt and staying bright white, the extraordinary suit has a unique radioactive quality. Both praised and scolded, Stratton eventually escapes from his job. But, will Stratton’s genius be used for good, or will the ‘perfect’ suit have its problems after all? LOOKING FOR CHEAP THE MAN IN THE WHITE SUIT TICKETS AT THE WYNDHAM'S THEATRE? With our huge range of cheap tickets for plays in London, a visit to the West End has never been better value. Book with us for The Man in the White Suit and enjoy a great play at a price that won’t bring down the curtain on your budget. Where is The Man in the White Suit?